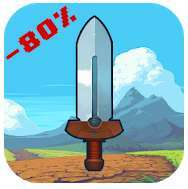 Evoland on Google play 59p down from £4-odd. It’s a very fun game that switches graphics and gaming styles as you play through it. Definitely worth buying, this is a steal. I saw this on gameranx video on top 10 paid mobile games, I purchased it right away. It was well worth the $0.58 (discounted).